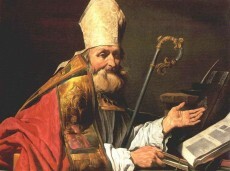 St. Ambrose was bone in 330 and became the Bishop of Milan. He also became one of the most influential ecclesiastical figures of the 4th Century, earning him the title of one of the “Four Original Doctors of the Church”. St. Ambrose entered the Benedictine Monastery of St. Vincent in Benevento, Italy, and became a Benedictine Monk. He became a close friend and tutor of Emperor Charlemagne and was known for his theological treatises and his commentaries on the lives of the Saints. Eventually in 778, Ambrose was elected the Abbot of St. Vincent’s, but was opposed by another member. He was summoned to Rome by Pope Adrian I in order to settle the mater, but Ambrose died on the way to Rome. He was born into a Roman Christian family about 330 and was raised in Trier. His father was the praetoran perfect of Gaul (political figure), and his mother was a women of intellect and piety. His siblings are also venerated as Saints, St. Satyrus and St. Marcellina. There is a legend that as an infant, a swarm of bees settled on his face while he lay sleeping in his cradle, leaving behind a drop of honey. His father considered this a sign of his future, eloquence of tounge and good speeker. In the late 4th century there was a deep conflict in the Diocese of Milan between the Catholics and Arians. When the Bishop of Milan died, the Arians challenged the succession by St. Ambrose’s election. He went to the Chruch where the election was to take place to prevent an uproar, but his address was interrupted by a call out from the crowd, “Ambrose, our Bishop”. The entire assembly agreed. He was called to Rome to make sure the dispute was settled, but on the way he died. The body of Ambrose with white vestments in the crypt of Saint Ambrogio Basilica, can still be viewed today, in a glass casket. St. Ambrose saw that he had a gift to learn the faith and to teach it to others. He worked hard to learn the faith, and his efforts were rewarded by being elected Bishop of Milan. Milan was a major part of the Roman Catholic Church of its time, as it headed up the “western” church in their day. He had a deep understanding of the faith, and one that is seldom seen to this day. Because of this knowledge he was named as one of the four original Doctors of the Church. Veneration to St. Ambrose is so strong today, 1,700 years later – that his body can still be viewed in a glass casket! One can learn much by studying the writings of this great Doctor of our Church.